A customer waiting for his to-go order in the foyer of Signature Thai Cuisine declared excitedly to an employee: “I can’t get enough of this food!” His words echoed straight into the dining room and into the ears of patrons taking advantage of the weekday lunch deals. Based on the northern-Thai egg noodle dish I was madly consuming at the moment, I considered rising from my chair to second him. 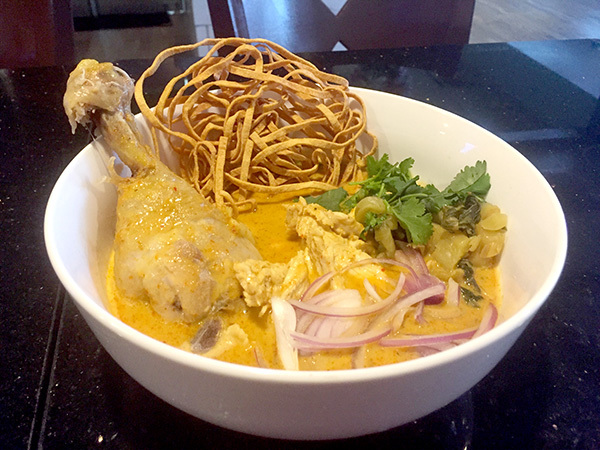 Known as khao soi, it’s one of the more non-pedestrian items on the regular menu in which the noodles are paired to a goldmine of tender chicken (sliced breast meat and a bone-in leg) and served in an orange-colored pond of yellow and red curries. Listed under “specialties,” it sells for $12.95 and proves there is luscious life beyond drunken noodles and pad Thai. 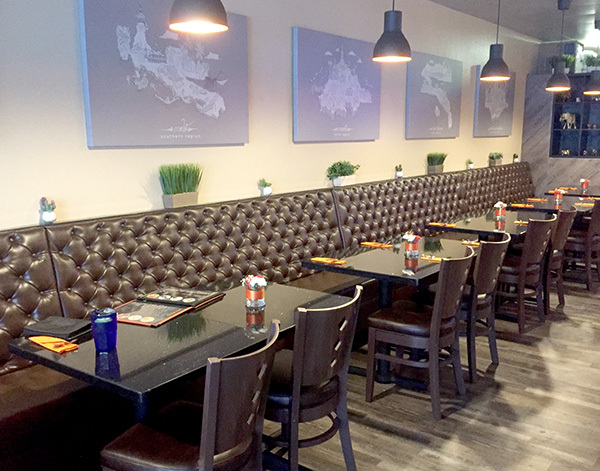 The 2-month-old restaurant replaces a donut shop in a Big Lots plaza devoid of ethnic kitchens. Tinted windows give the impression of a shuttered business. But just inside is a clean, nicely decorated space with fresh-cut flowers adorning sparkly black tables. Intent on leaving with a weighty doggy bag of leftovers for dinner that evening, I opted also for two of the $8.95 lunch specials: hot basil with mock duck, and yellow curry with the above-mentioned chicken breast. Each meal included a cup of vegetable soup, a basic green salad with sweetish peanut dressing, an egg roll, and rice. I accepted doubles on everything. The soup flaunted a medley of cabbage, zucchini, carrots and leafy greens in a lovely, clear broth that tasted a little like Lipton Cup-A-Soup, although not as salty and not at all a bad thing. My exceptionally friendly waiter said it is house-made. The egg rolls turned up cold in the middle. I sent them back and received crisp, piping hot replacements with a gracious apology. In the hot basil stir fry, I loved the zesty brown sauce and shredded pieces of vegan duck, which actually resembled succulent beef. The dish’s downside, however, was copious amounts of under cooked green beans and bell peppers. I had wished they matched in texture the soft “meat” or that they were cut as thin as the carrots also comprising the dish. 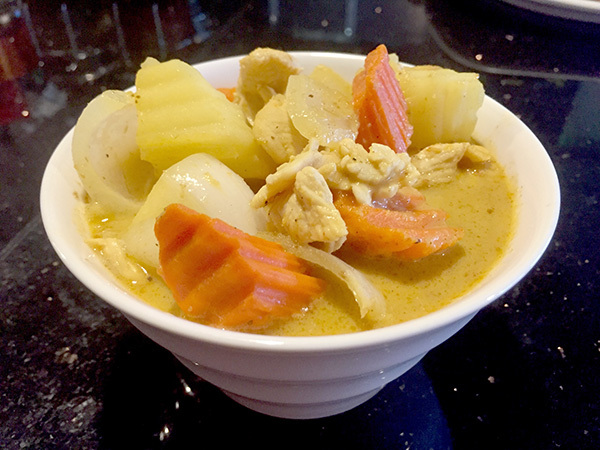 If you’re a fan of traditional yellow curry made with coconut milk and draped over potatoes, carrots, onions and a protein of choice, you won’t be disappointed with this full-flavored recipe. Here, the veggies were tender, and the chicken breast was plentiful. Nary a drop of the precious liquid went to waste, as I dredged everything through it afterwards — the rice, a leftover egg roll and even some of the lettuce leaves from my salads. Draw me a bath of this stuff and I’ll soak in it all day. Kudos to the kitchen for getting the spice level right. In all cases, I opted for “2” on a 10-level scale. I normally go a few notches higher, but when sharing Thai leftovers with my spouse, anything spicier results in fits and screeches. 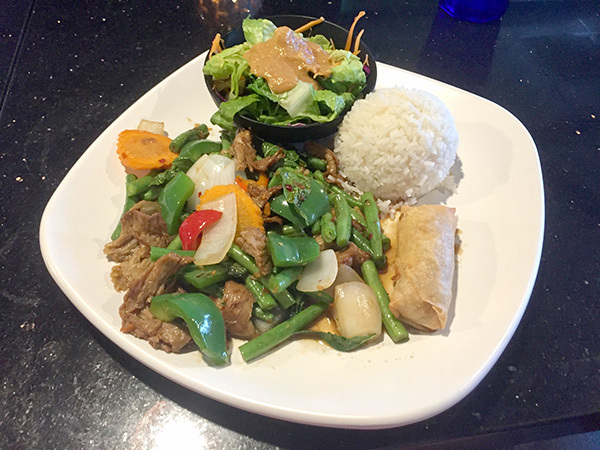 Other reduced-price lunch specials, which offer a choice of chicken, pork, beef, seafood or tofu, include cashew stir fry; green or red curry; pad see ew; drunken noodles; and more. From the regular menu, you’ll find everything from vegetarian curry puffs and papaya salad to crab-fried rice, royal duck curry, and Chinese-inspired orange chicken. 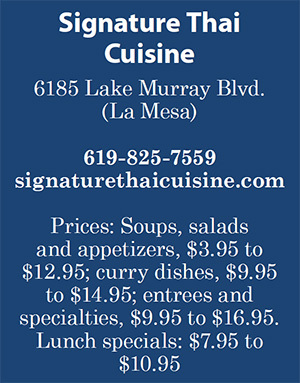 Signature Thai Cuisine opens daily at 11 a.m. and closes at 9 p.m. Sunday through Thursday, and at 9:30 p.m. Fridays and Saturdays.